If you’re wanting to add some additional shelving to a room but don’t want any majors jobs or installation, hanging shelves may be just what you’re looking for. They make for fairly easy projects and give you just the extra storage or decor space you’re looking for. 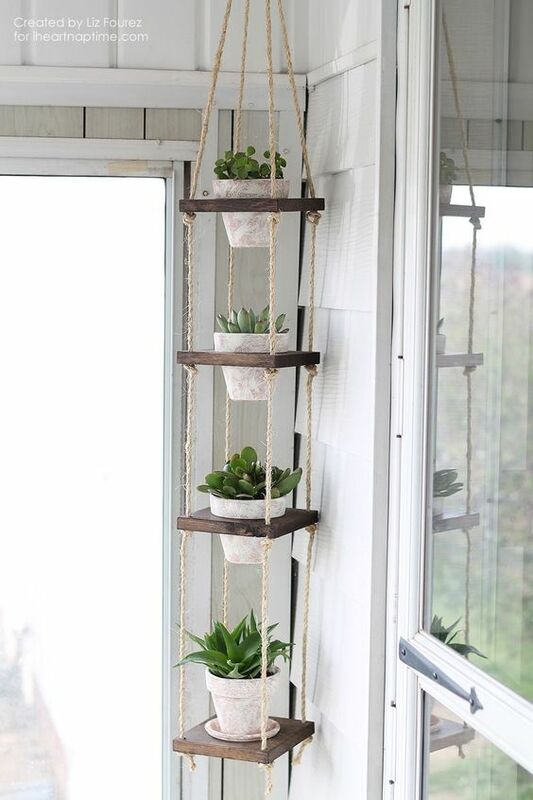 Here are 10 fabulous DIY hanging shelf projects. What a nice accent piece this leather strap shelf would make for any room! Put as much or as little as you’d like on the shelf to capture the feel you’re looking for. All you’ll basically need are some leather straps, screw hooks, and wall plugs. Love it! Find the tutorial on Burkatron. Decorate with a wood plate floating shelf. Make your own using nothing more than a round wood plate and yarn or twine. Wood plates can be found at Home Depot. Floating shelves create such welcome variance to a room! The succulents were a great choice to put on the shelf. 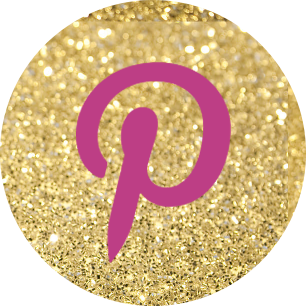 Get more details from Place Of My Taste. Anyone care for some Dim Sum? Well, perhaps not for a meal, but how creative is this round hanging shelf using a Dim Sum steamer basket?! 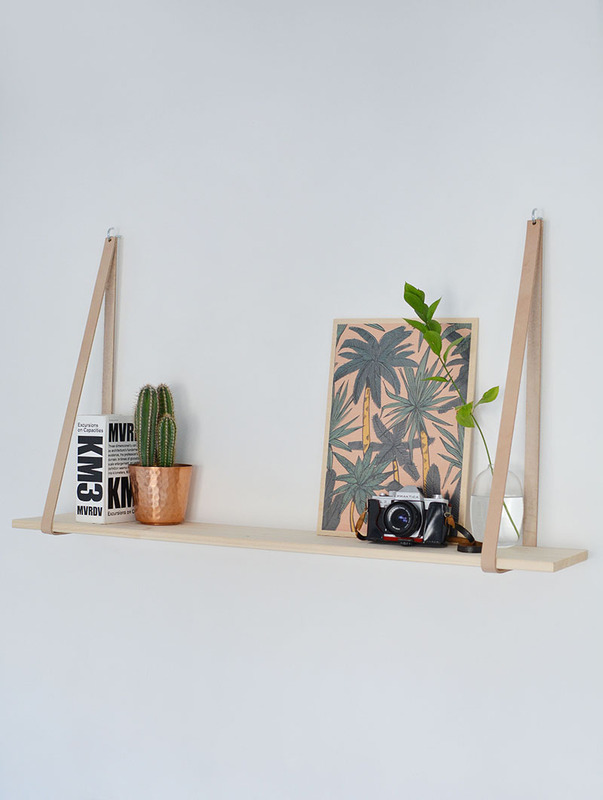 Make the shelf with another piece of ply wood and then attach some rope or twine. Dim Sum steamers can often be found locally in Asian marketplaces or Sur la Table. You can also find them on Amazon and other online stores. 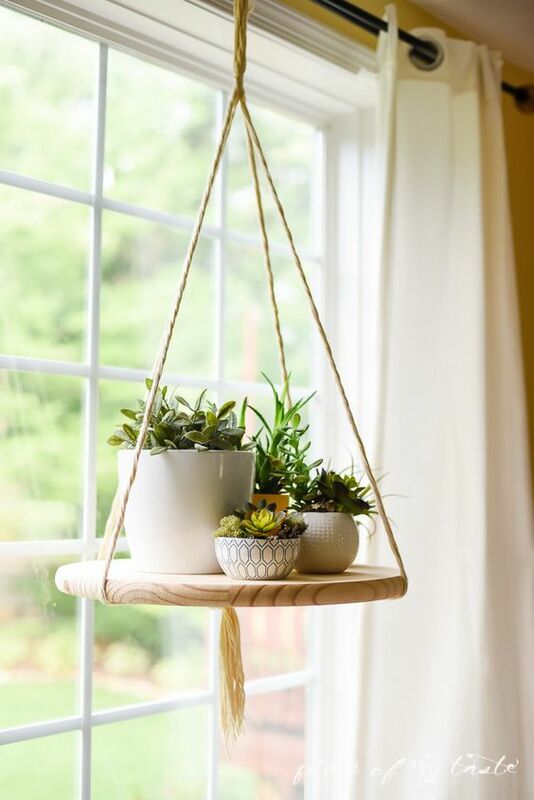 Learn how to make your own round hanging shelf here from A Pair & A Spare DIY. 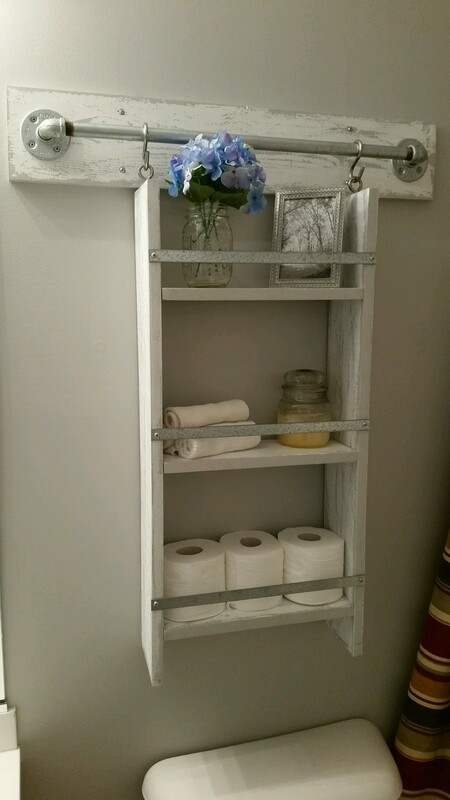 Here’s a handy hanging shelf for a bathroom in need of additional storage space. I like how they used a tower rack to actually hang the shelf! Visit Ana White’s blog for more information. Create even more shelving space with a hanging shelf. I think it makes such a classy statement as well. Home Depot shares the DIY. This long vertical plant shelf would be such a nice accent piece in the right corner! The rich wood color and white pots compliment each other well. Get the tutorial here. I’m in love with this dual shelf and hanging rack! Although the baby clothes are adorable hanging from the wood rack like that, you could also drape special quilts over the rod. What a precious look this adds to a bedroom! Find the picture tutorial on Triibe. Repurpose IKEA shelf brackets into hanger racks in a closet for more clothing storage. Isn’t it great when one item can be used in multiple ways? Here’s another creative IKEA hack. Use this hanging shelf for, well, hanging! You’ll need to translate the page, but find more information on this hack from Ich Designer. 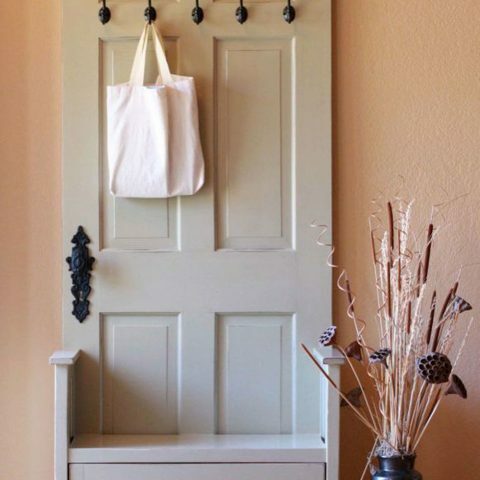 Decorate your craft room with hanging paint storage. No more messy paint drawers! Get the DIY tutorial from Mad In Crafts.